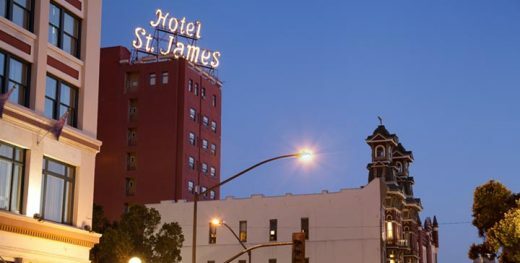 Of squiggled neon sings its beacon style. And beauty visits with a thousand vacancies. Divine each door a way, each room a church. We had Chris Cook in the studio to talk about his most recent book Damn Good Cookie, a collection of original poems. 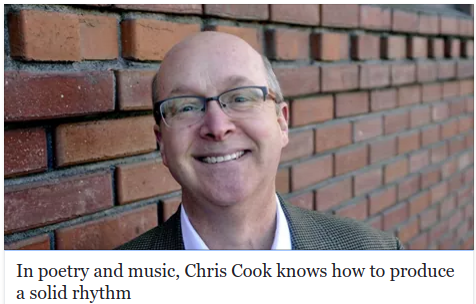 Chris talked with Verne about what he does when he’s not playing trumpet with the Spokane Symphony–writing and reading poems. And that’s exactly what he’ll be doing this Saturday, June 18th at 7:30pm at Auntie’s Bookstore. Chris gave us a preview of that reading with a selection of poems, and he also talked about his writing and ideation process. Damn Good Cookie was published this past May by Korrektiv Press. “Damn Good Cookie” (Korrektiv Press, $15), which hits shelves on Saturday, is Cook’s second book of poetry, following 2014’s “The View from the Broken Mic.” It features 42 poems, all of which Cook has performed for audiences. Some of them are relatively new, while others have been in his repertoire for more than a decade. “I’m pretty proud of this one. 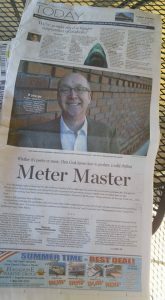 It shows a more complete writer,” Cook said. 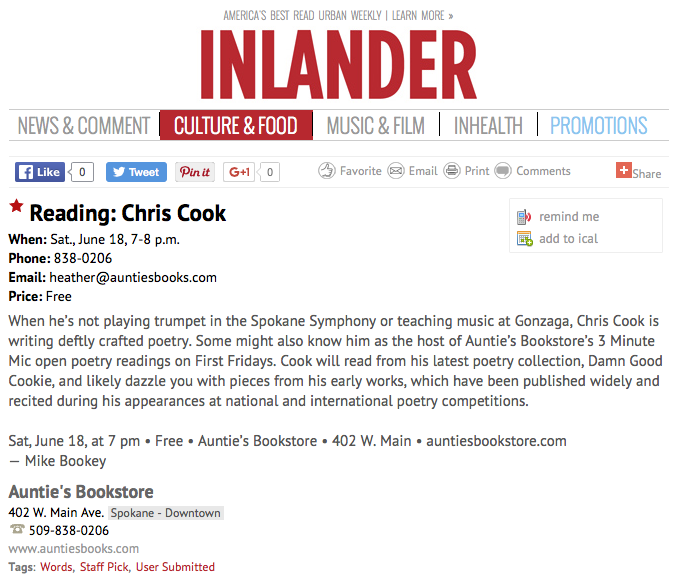 Enjoy an evening of poetry this Saturday night at Auntie’s Bookstore in Spokane with Chris Cook, the proprietor of Auntie’s 3-Minute Mic reading series. Cook is the author of two poetry collections: The View from the Broken Mic and his newest book Damn Good Cookie. In the Spokane tradition of Vachel Lindsay, Chris Cook sings. Before you register the dark humor, the sharp satire, or the elegant constructions of the meter, you’ll notice the music of these poems. Whether at the park, in memory, or elsewhere on the periphery, Cook writes large-hearted poems that remind us how poetry moves: from ear to mind to heart.